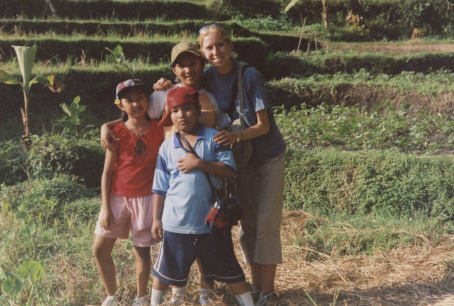 2005 Bali Summer Immersion alumna Laura Shirreff shares her reflections on a global journey exploring the intersection of sustainability, design, and culture. How did you become interested in this particular VIA program and the topic of Fair Trade? I was in my first year of my textile degree program at Rhode Island School of Design and was looking for a unique summer opportunity that would combine my interests in sustainable/ethical textiles as well as Asian culture. I was also looking to challenge myself, to volunteer and to do something “outside of the box.” When I came across the VIA summer immersion program I was immediately drawn to its comprehensive offering. The opportunity to volunteer was equally balanced with the opportunity to learn. 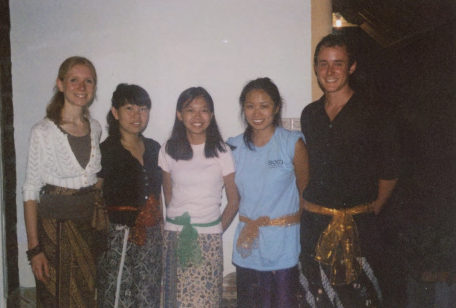 The summer immersion program allowed me first to study the language, history, politics, arts, culture and spirituality of the Balinese people before I started my volunteer placement. I believe this was crucial as it allowed me to better understand the context in which I was working and how I could best be of help. Had you ever lived or studied abroad before joining a VIA program? Yes I did have some experience. I already had an international background as I was born in the US and was raised in the UK. I studied at an international high school, where I was able to meet and work together with peers from all over the world with various cultural backgrounds. I travelled to both France and Spain for language exchange programs, so I already had experience of living with a host family in a different country. In my first year of University, I also had the opportunity to study for a week in Kyoto, Japan. I travelled there as an assistant to a curator who worked with well known contemporary textile artists. I was able to meet with those artists and visit their home studios. It was an incredible experience that opened my eyes to how art could be a very moving and powerful expression of cultural tradition as well as spirituality. I chose the International Baccalaureate program that was offered at my school as I wanted a broad and challenging education that would help me to be more informed about the world around me. I loved studying with people from all around the world. It was wonderful to hear so many languages being spoken at the lunch table! The language exchanges I took part in (in France and Spain), helped me to realize how immersion was vital for fluency and true understanding. When I listened to the language being spoken every day, I began to assimilate to that language and even began to think in it. I stopped translating every sentence, the words and communication started to flow more naturally with less effort. The better I could communicate, the more I could feel at home in the environment and get to know people more deeply. What have you been doing since the program ended? Since the VIA Bali Summer Immersion ended, I graduated from college in 2008 and was hired as a full time technician at Rhode Island School of Design. In my free time, inspired by the experience I had at MITRA Bali (fair trade organization) and motivated to help the local artist community in Providence, I founded a non profit called “Waste Not Want Not.” This all happened just after the recession. I spent 3 years working to inspire and support artists who worked in reclaimed materials. This included but was not limited to fabrics and clothing. We collected donations, many from the universities, and allowed the artists to use the materials for free, so they could be “up cycled” into a creative and sellable product. The profits of which could then go back to support the artists as well as fund the organization. Later I was offered a position as a textile designer at ICICLE, one of China’s first environmentally conscious fashion brands. So in 2011 I moved to Shanghai to work at their head office. I lived and worked there for six and a half years. I met my husband Bone in 2013 and we married in 2015 in his hometown in Gansu Province. In November 2017 I left my full time job at ICICLE to collaborate with my husband. I now work as a freelance textile designer and yoga instructor for our company RIGPA ARTS. We plan to spend 1/2 the year living and working in the US and 1/2 the year in China. We have combined our skills and passion for art, music and spirituality, to offer specialist designs, videos, performances, classes, events, tours and retreats. What is your most memorable experience from the program? My most memorable experience I had was towards the end of my stay in Bali. There was a day when the mother of my host family, took me on her motor-bike to a nearby beach. We sat on the beach, just the two of us, ordered some local barbecue and stared out at the horizon. We were able to chat and share deep feelings and emotions talking about various aspects our lives. 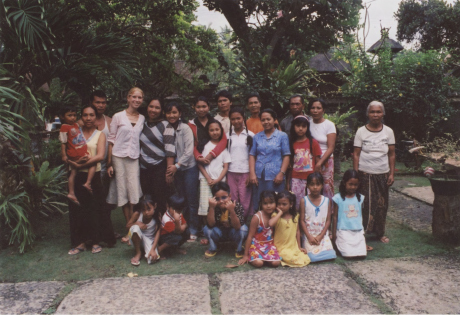 I was amazed not just by how we could communicate so profoundly even though I had only been learning Indonesian for a short time, but more than that, the mother was so open and caring to me, I was grateful that we could share such a deep moment together. I truly felt that my host family was indeed my family… despite our different cultural backgrounds, we could share so much and feel very close. Do you think your participation in the program has led you to take part in any new or additional activities? Absolutely. I am certainly not fearful of adventure! I still love to travel and I seek an authentic experience and connection to the local culture whenever I can. My experience in Bali helped me to think outside the box when it came to career decisions. It helped me to take the leap and move to Shanghai for a new textile designer position. I knew that though the first months in Shanghai would be challenging, I could push myself through it and that the chance to immerse myself in a new culture and language would be one I would never regret. To what extent do you still think about the program since it ended? I have thought about quite a bit actually. I recall my experience of course, each time I travel back to Bali but also sometimes when I am in more remote areas of China and especially when spending time with my husband’s family. I think back and remember that profound feeling of connection and warmth from a family that I was not born into, but who still adopted and embraced me as their own. To what extent have you had conversations with people outside of the program about things that you learned during the program? I share my experience whenever it is relevant. Certainly I refer to it the most when I am in conversation with people about Bali in particular. To what extent do you feel connected to other people from the program? Strangely enough, I did not feel so connected with the other volunteers that were on the VIA summer immersion program. I think I spent more energy and concern for the family that was hosting me. I felt, in some ways, we had more in common. 🙂 I didn’t keep in touch with the other volunteers actually. However I do feel very connected to other VIA alums and VIA staff, particularly those we met during the Yunnan alumni trip several years ago.